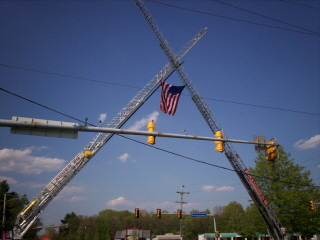 The Nottingham Fire Department (Ladder 65) and Warrington Fire Department (Ladder 29) honored fallen Marine , First Lt. Travis Manion during his funeral May 5, 2007. 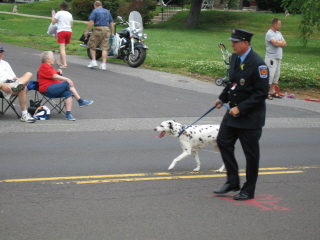 Lt. Manion, of Doylestown, was killed in the Anbar province of Iraq April 29, 2007. Our thoughts and prayers go out to his family and friends and we thank him for his unselfish duty and dedication to our country. 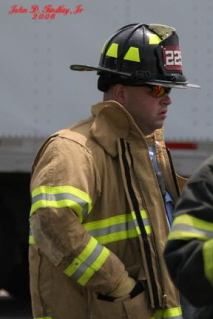 Congratulations to Firefighter - VP Fred Sponheimer Jr.
Congratulations to firefighter - Vice President Fred Sponheimer Jr. , Fred has earned NFD Life Member status after 15 consecutive years of active service in the department. 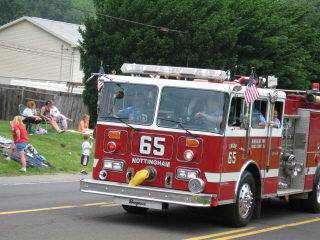 The officers and members of the Nottingham Fire Dept. 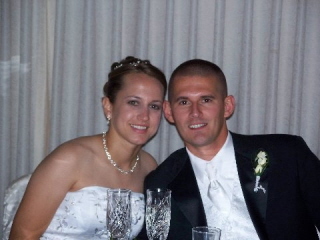 would like to congratulate Engine Lt. David Marshall and his new bride Caryn who got married on July 14, 2007. We wish the happy couple the best of luck. 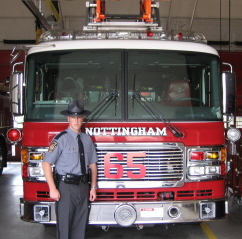 The officers and members of the Nottingham Fire Department are proud to announce that FF/EMT Derek Felsman has successfully completed / graduated from the PA State Police 124th Cadet Class. Congratulations Trooper Felsman be safe and continue to keep us proud. Congratulations to FF/ Mark Pachucki and his wife Stacy on the birth of their new born daughter Olivia Pachucki on September 26, 2007. We wish them all the best! The High / Mid Rise Seminar presented by Chief Garrity of the Philadelphia Fire Department this past weekend was a huge success , drawing firefighters from as far away as Canada. 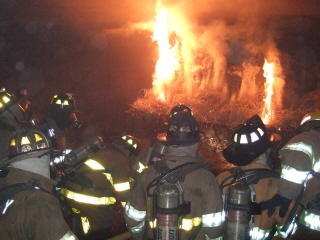 The two day seminar was sponsored by the NFD and was held at the Bucks County Technology Park. 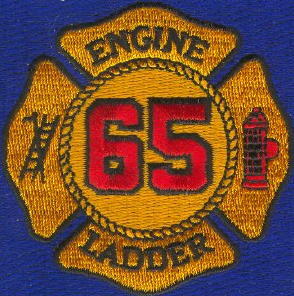 Ladder 65 took part in a township emergency drill Saturday November 3rd. The drill was the final segment of a four part Emergency Management Training Program. 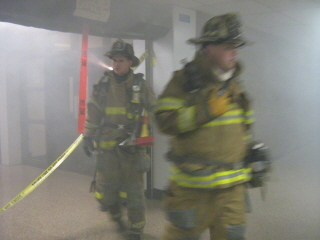 The drill took place at the Bensalem High School and involved active shooters, pipe bombs, fires and a collapse of the North Gym. Crews from stations 65, 4, 44, and 37 participated in the training along with Bensalem Police, Bensalem EMS, Bensalem FMO, Bensalem School District, Bucks Co. Red Cross and other emergency responders. 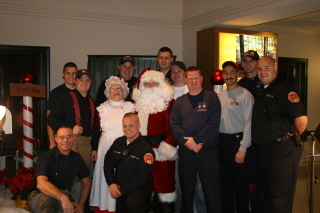 With the help of the NFD Santa Claus arrived at the Bucks County Visitor Center's 2nd Annual Christmas Fest Display. The NFD sponsored a tree and some of the firefighters and their family's helped decorate it. 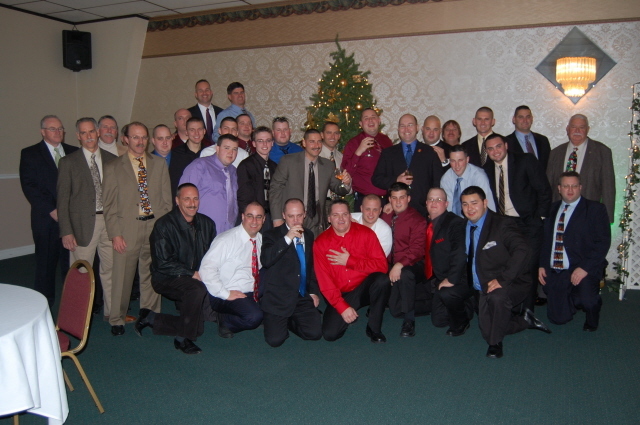 The Nottingham Fire Department held its Annual Christmas Party December 15th 2007. Once again the party was a huge success with a large number of Life Members and distinguished guests in attendance. The following is a list of citations and awards that were given out. Fire Department Unit Citation for brave and heroic efforts in firefighting and rescue operations at the Franklin Commons Apartments on May 18, 2007 - Chief Ron Harris, Deputy Chief Sponheimer, Capt. 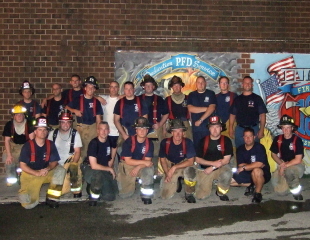 Sarcewicz, FF Topley, FF Pachucki, FF Fontaine, FF Costello, FF Sponheimer, FF Shirley. 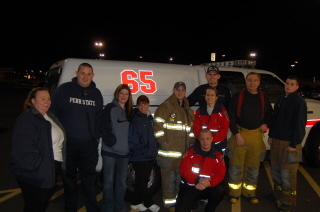 All said and done the Nottingham Fire Department and the Bensalem Police Department were responsible for 1720 toys being donated to the 2007 Toys for Tots campaign , thats 815 over the 2006 total of 905. Thank's to all who donated toys. Walmart donated gift cards to Bensalem Twp. Emergency Services this week so members of the Nottingham FD, Trevose FD, Bensalem Police and Bensalem EMS could take 8 needy area school children Christmas Shopping. This is the second year in a row that Walmart has been gracious enough to donate the gift cards. Congratulations to FF/EMT Jason Harris and his wife Teresa on the birth of their son Timothy Michael Harris on December 18, 2007. 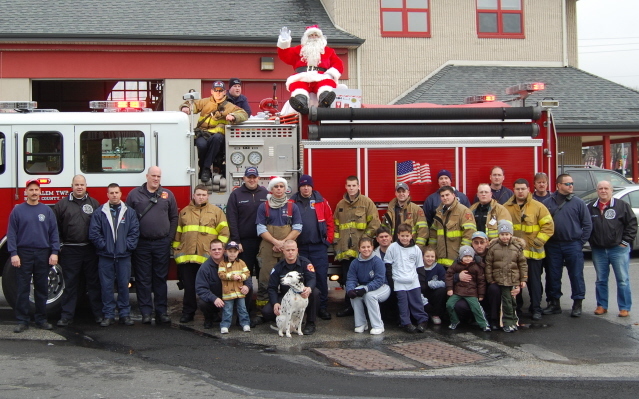 Once again this year Firefighters from the NFD teamed up with Santa for a ride around the local. The NFD collected can goods for a local church's food bank and handed out candy canes and presents to children.